A senior SNP MSP has urged two former colleagues to quit parliament, after they resigned from the party over its new policy of backing Nato membership. Christine Grahame said John Finnie and Jean Urquhart, who now sit as independents, should leave Holyrood, under the SNP code of conduct. 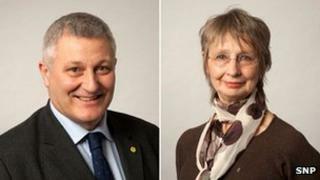 The two politicians were elected to the Scottish Parliament for the SNP on the Highlands and Islands regional list. Mr Finnie and Ms Urquhart said they still supported Scottish independence. The change of stance, to accept Nato membership in an independent Scotland, was approved at the SNP conference on Friday, but the policy was opposed by several MSPs and rank and file members - including Mr Finnie and Ms Urquhart. Ms Grahame, convener of the Scottish Parliament's justice committee, told BBC Scotland Mr Finnie and Ms Urquhart must now comply with the SNP code of conduct which she said states, "any member resigning from a party group at any level of government owes a duty to the party also to resign as a member of the local authority or parliament to which he/she was elected as a party candidate". Ms Grahame, a former South of Scotland list MSP who won the constituency of Midlothian South, Tweeddale and Lauderdale at the last election, said regional members were in parliament "purely for the party". She said: "If you come in on the regional list, you come in on the party ticket alone - your name is not on the ballot paper. "The regional list is to compensate for those votes that were cast for the SNP and other parties when they didn't win constituency seats. "So the principle here is - you're here simply to represent a number of SNP votes, you're no longer in the SNP, you should resign." SNP Westminster leader Angus Robertson asked SNP members to reverse a 30 year-long opposition to the pro-nuclear weapons defence alliance. He said the change was dependent on Trident nuclear weapons - currently based at Faslane Naval base on the Clyde - being removed from Scotland and on Scotland's refusal to host nuclear weapons in the future. But Mr Finnie and Ms Urquhart, who said they would continue to support the manifesto on which they were elected, said they could not belong to a party with a strong anti-nuclear stance which wanted to join a "first strike nuclear alliance".